Really cool synth for the iPad. Highly recommended by the ipadloops team. See for your self! SynthTronica is a powerful, flexible polyphonic synthesizer for the iPad — a unique blend of virtual analog synth, sampler, and precision vocoder. 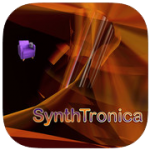 SynthTronica has many innovative and complementary features which take full advantage of the multitouch interface of the iPad. Watch the video below and visit the links above for more details.